In the spirit of Stoptober I'm endeavouring to keep my food waste to a minimum and use up items that have lain dormant in the cupboard for months. Soup cravings have started to stir of late and have and spurred me back into the kitchen at lunchtimes. It took one leftover aubergine, one neglected tin of butterbeans and exactly 35 minutes to spare, for this new soup to be added to my repertoire. You don't have to add mushrooms (I only had 1 aubergine) but they do work well together. 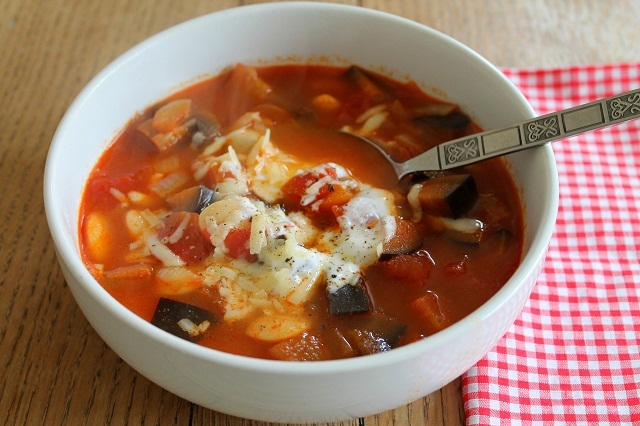 Both aubergines and butterbeans are low in calories for their size, so this chunky soup offers maximum comfort for minimum calories. I really enjoyed its flavour and bite. Heat the oil in a saucepan and fry the onions until soft and golden. Stir in the harissa and cook for a minute or two. Add the aubergines and mushrooms and stir to coat them loosely with the harissa. Next add the tomatoes, butterbeans and the stock. Bring to the boil and simmer for up to 30 minutes. Serve with a swirl of natural yoghurt and/or a scattering of grated cheese for extra decadence. We enjoyed this for a weekend lunch and there was enough leftover for 2 more generous bowlfuls on Monday. Low carb comfort. It looks delicious and it is definitely soup weather! I have bookmarked this. It looks lovely.